“Beglobis” means “homeless” in Lithuanian. The shelter of the same name has been opened in October 2009 as the Vilnius branch of the Lithuanian Society for the Protection of Animals (LisPA). Its aim was to save homeless animals from being killed in Vilnius Municipality Animal Shelter Closed Joint-Stock Company “Grinda” in Vilnius. In 2009, the organization participated in the meeting with a member of Vilnius City Municipality Council and the directors of “Grinda”. The agreement was reached: “Grinda” will cooperate Vilnius branch of LisPA and would strive to ensure that healthy animals would no longer be euthanized after the end of the quarantine period. In order to do this, a social project called “Wagons of Life” was created. All the animals were handed over to the “Wagons of Life” for further care and new homes search. The Vilnius branch of LisPA did its best to stop the mechanism of animal killing in “Grinda”. In 2013, the society established a voluntary organization “Beglobis” to save stray animals. “Beglobis” is financed only by donations. 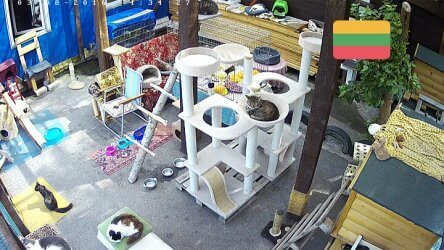 The shelter of this organization, seen on the live stream, houses about 30 cats and 25 dogs. -to reveal cases of animal abuse and make sure the abusers would be punished by law. The goals of the shelter are ambitious and warm-hearted, but in order to achieve them, they need our help. You can support the shelter by buying necessary items in the online shop below and all the products purchased by you will be delivered to the shelter as soon as possible!